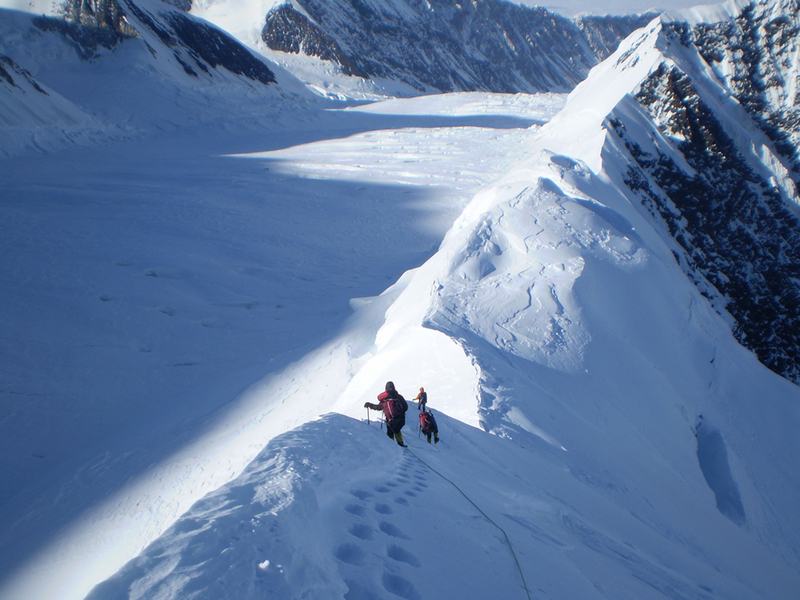 Join us on an ascent of Denali in the footsteps of the pioneers! This is an extremely challenging expedition that should only be considered by very fit and experienced mountaineers. 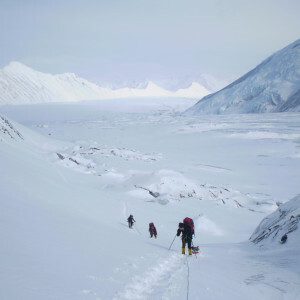 For those with the proper preparation, we have little doubt this could easily be the trip of a lifetime, as we will access the remote north side of Denali in early April, and climb the route forged by the first ascentionists of what was known at the time as Mount McKinley. 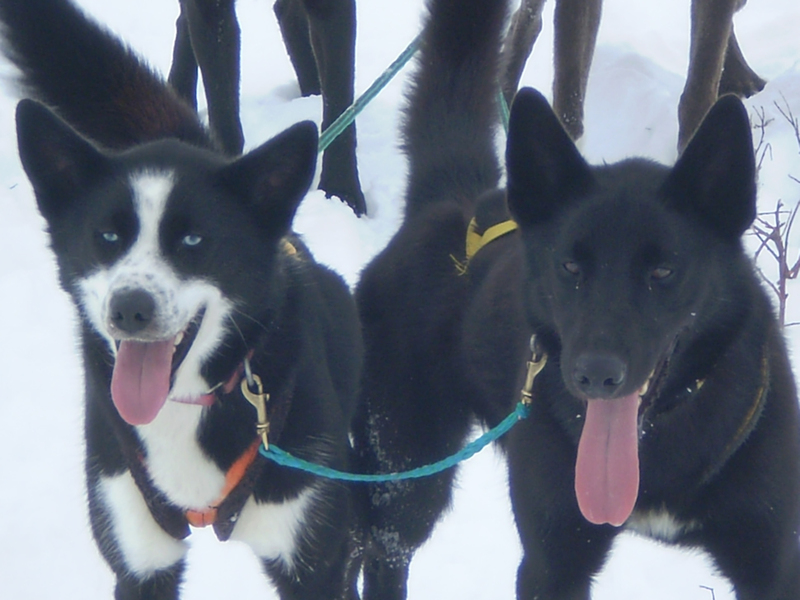 The first day will be spent learning to mush a dog team with Jon Nierenberg, a professional musher and owner of Denali Dog Sled Expeditions. 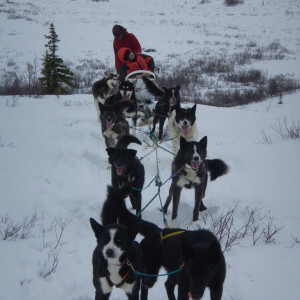 Jon has been mushing in the area since 1982 and in the Park since 1985. Depending on conditions, the next 4 – 6 days will be spent traveling through the northern portion of Denali National Park with climbers mushing their own teams of dogs. 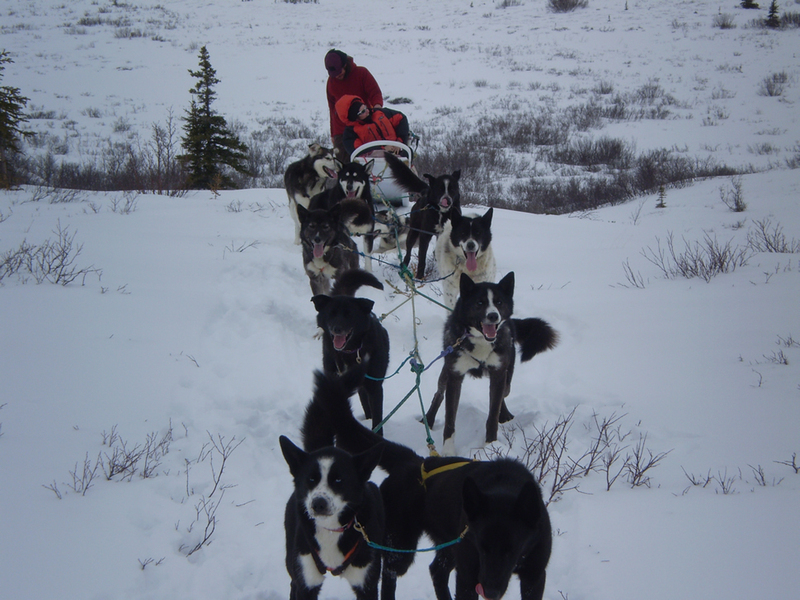 We will say goodbye to our sled dogs at Cache Creek and hike up McGonnagal Pass to our cache of mountain food and supplies that we transported in via dog freight earlier in the winter. From this point we will climb through the icefalls of the Muldrow Glacier and up Karstens Ridge to our high camp on the Harper Glacier. After summit day, we will descend the West Buttress Route to fly out in ski planes from the Southeast Fork of the Kahiltna Glacier. 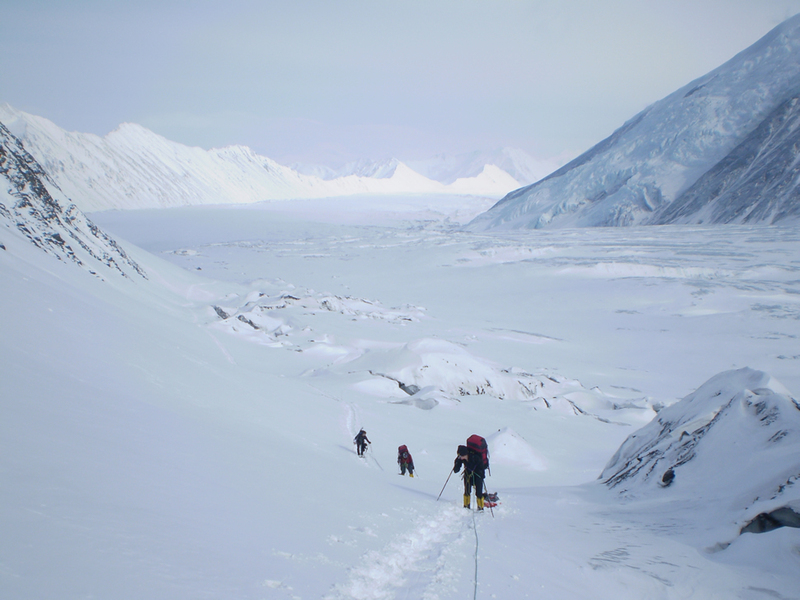 Any climb of the north side of Denali is a serious undertaking. A north side climb in April is an even more serious endeavor. 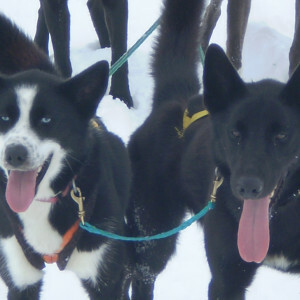 Using sled dog teams to get us across the tundra adds an element of authentic Alaska that is not necessarily found on most Denali expeditions. When traveling with the dog sleds, you will also have access to a heated tent, which will help ease your transition to the colder temperatures of early season. Once we start the climbing portion of the expedition, we will rely on our modern clothing systems, clear team communication, and conservative decision-making to help mitigate the cold. By traveling early in the season, we should be able to cross the McKinley River while it is still frozen and eliminate one of the most hazardous elements of a north side climb. 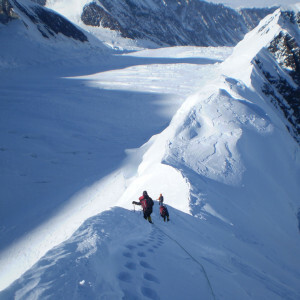 The timing of this trip puts us on schedule to summit about the same time as will early season West Buttress expeditions. The remote nature of this expedition requires us to be very selective in who we enlist on the team, and team size will be limited to four to six climbers and two guides. This is an expedition unlike any other on Denali and we are very excited to offer it. Please call us to inquire about specifics. DAY 2: Depart Earth Song Lodge, travel 28 miles to the Sushana River Cabin along Stampede Trail, passing by the bus from the book and recent movie, Into the Wild. 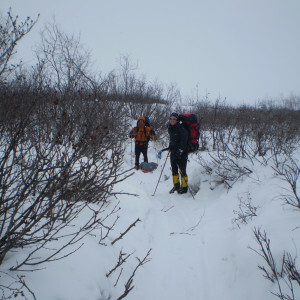 DAY 3: Mush from the Sushana River Cabin to the Lower Toklat Patrol Cabin, 22-38 miles (depending upon trail conditions). DAY 4: Mush from the Lower Toklat Cabin to the Upper Toklat Cabin on the Park Road Corridor, 25 miles on the Toklat River and traversing the Toklat Narrows. DAY 5: Mush from Upper Toklat to Thorofare Gorge or McKinley River, making camp after 17-30 miles. 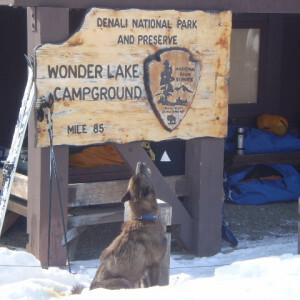 DAY 6: Camp to Wonder Lake and Kantishna, pick up assistant sled guide (to return with dogs after dropping off guests) and two Mountain Trip guides who will ski-jour behind the sleds to McGonnagal Pass. 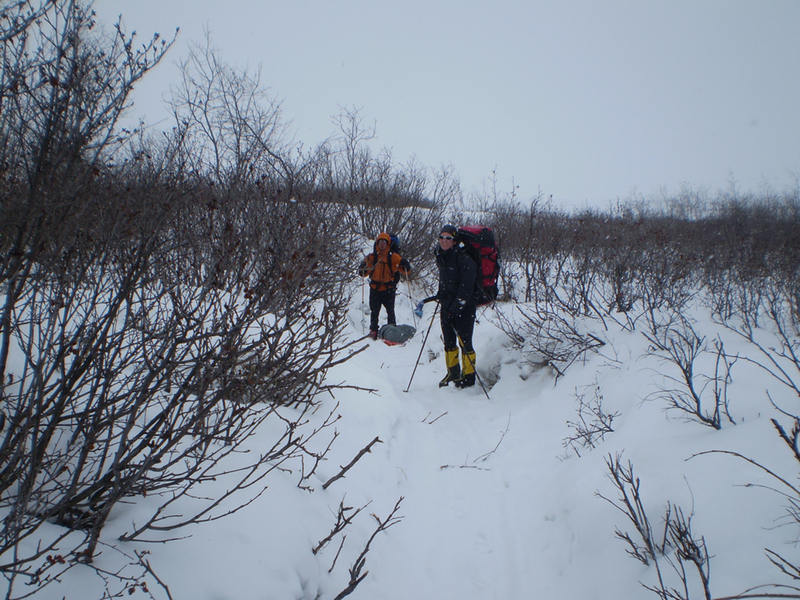 DAY 7: Wonder Lake to Cache Creek, from where the mushers will return to Wonder Lake. DAY 8: Mushers return east with dog teams, climbers head up over McGonnagal Pass onto Muldrow Glacier, to collect our cache of food, fuel, and mountain equipment that we dog-sledded in earlier in the season. DAY 14: Move to Camp 3. DAY 21: Carry to top of 1st Harper Glacier Icefall, by Sourdough Gully. DAY 24: Move to High Camp on upper Harper Glacier. DAY 27: Move over Denali Pass and down to the 14,200 Camp on the West Buttress. DAY 28: Descend to Kahiltna Base Camp. 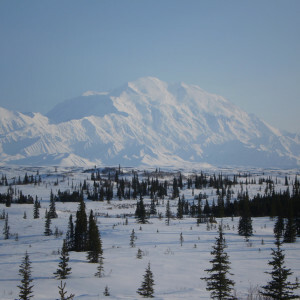 DAY 29: Fly to Talkeetna and drive to Anchorage. The following is a general list of required gear for climbing the North Side of Denali via the Dogsled Approach with Mountain Trip. Climbers joining us on an expedition will receive an updated, comprehensive equipment list that may supersede this list. Many of the items on the list need to fit you well in order for you to fully enjoy your experience on the mountain. Please plan ahead with equipment purchased for your trip so you can be certain that your gear fits you well. Cresting McGonnagal Pass is not the place to discover that your pack is too small for your torso, or that your boots give you blisters. Recommended items reflect the opinions of our guides. We have used and have faith in all of our recommendations, but they may not necessarily fit or work for you. 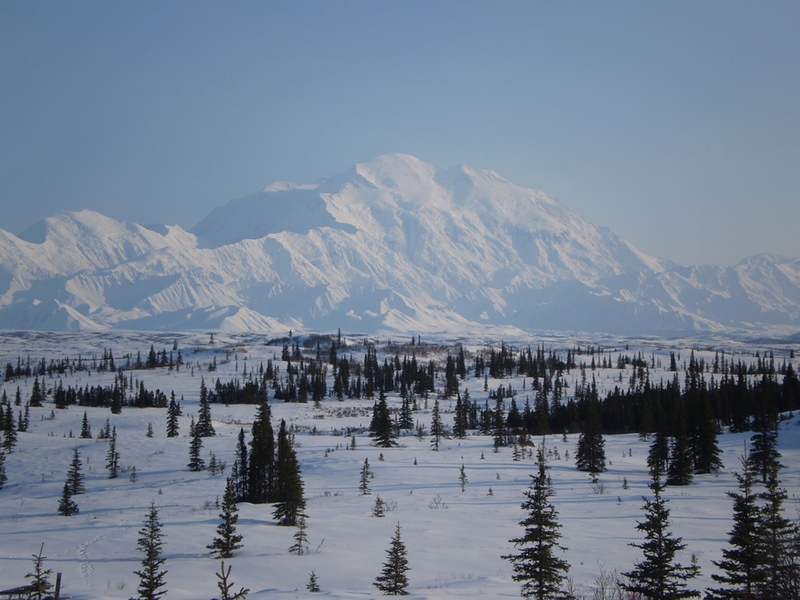 From 1906 – 1908, Harry Karstens and Charles Sheldon made forays toward the north side of Mount McKinley. Two years later, their reconnaissance paid off when Tom Lloyd, Charley McGonagall, Billy Taylor, and Pete Anderson left Fairbanks with loaded dogsleds in what was to become known as the Sourdough Expedition of 1910. These four intrepid pioneers discovered a key pass to access the Muldrow Glacier and pushed up the glacier to a camp at about 11,000 feet. Their legendary 18 hour summit day, fueled by a thermos of coffee and a bag of doughnuts, dragging a 14 foot spruce pole, is legendary. 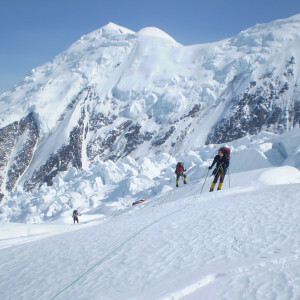 They picked their way through icefalls and up Karstens Ridge to plant the pole on the North Summit of Denali. In 1913, a team led by Hudson Stuck followed the Sourdough’s route to make the first ascent of the South Summit, the highest point in North America. 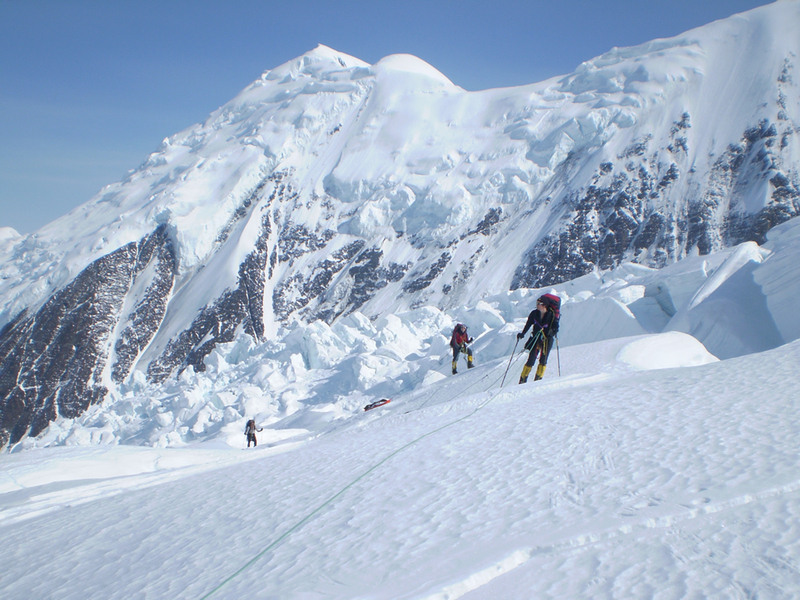 One hundred years after the first ascent of Denali, Mountain Trip is excited to offer a select few climbers the opportunity to get a taste of what the original pioneers experienced. 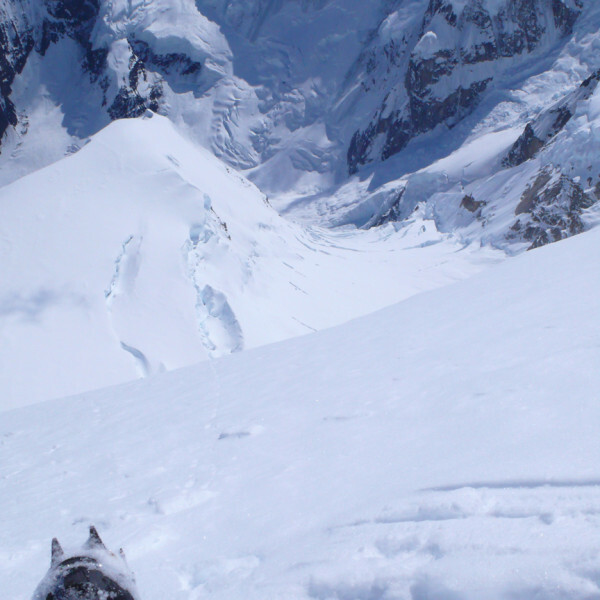 We have joined forces with Denali Dog Sled Expeditions, which operates under a concession contract with Denali National Park out of the Earth Song Lodge in Healy, AK, to enable you to climb Denali via a dogsled approach! • Due to the amount of pre-expedition logistics required for this particular Denali expedition, we require a $5000 deposit to secure a spot on the team. Your submission of a deposit constitutes your acceptance of this Fee Schedule, Refund and Cancellation Policy. 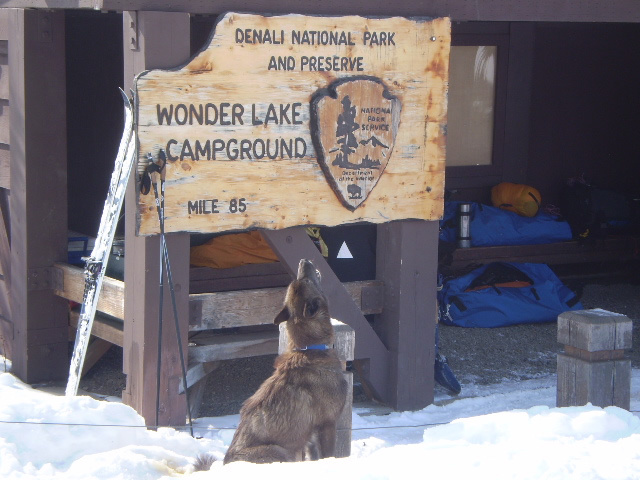 • Deposits for our Denali by Dogsled expedition includes a non-refundable $3000 administration fee, due to the nature and extent of pre-trip logistics. • Any additional lodging including post expedition lodging. • Mountaineering special use fee ($270 for climbers 24 years old and younger, $370 for older climbers) and Denali National Park entrance fee ($15) paid to the National Park Service at the time you register for your individual climbing permit. 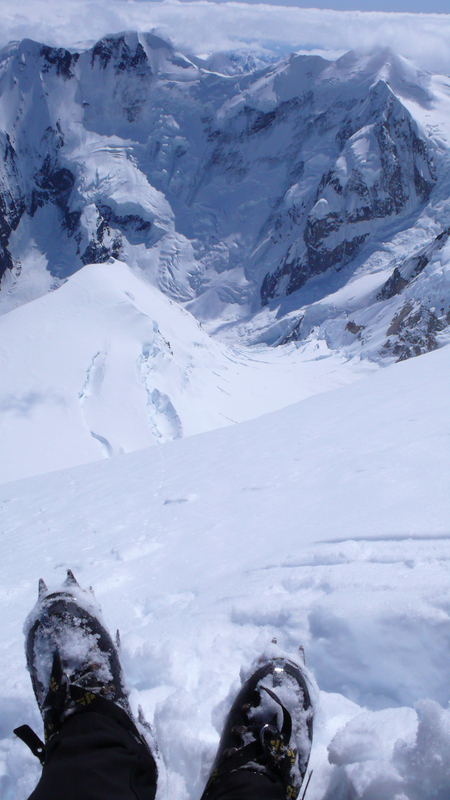 This is a sort of "Dream Trip" that we have organized once for a select team of climbers. Please contact our office for details on costs and logistics.